A stem connects the roots to the leaves, provides support, stores food, and holds the leaves, flowers, and buds. Most stems are found above ground, but some of them grow underground. Stems can be either unbranched or highly branched; they may be herbaceous or woody. Stems connect the roots to the leaves, helping to transport water, minerals, and sugars to different parts of the plant. Plant stems always have nodes (points of attachments for leaves, roots, and flowers) and internodes (regions between nodes). The petiole is the stalk that extends from the stem to the base of the leaf. An axillary bud gives rise to a branch or a flower; it is usually found in the axil: the junction of the stem and petiole. Stems are a part of the shoot system of a plant. They may range in length from a few millimeters to hundreds of meters. They also vary in diameter, depending on the plant type. Stems are usually above ground, although the stems of some plants, such as the potato, also grow underground. Stems may be herbaceous (soft) or woody in nature. Their main function is to provide support to the plant, holding leaves, flowers, and buds; in some cases, stems also store food for the plant. A stem may be unbranched, like that of a palm tree, or it may be highly branched, like that of a magnolia tree. The stem of the plant connects the roots to the leaves, helping to transport absorbed water and minerals to different parts of the plant. The stem also helps to transport the products of photosynthesis (i.e., sugars) from the leaves to the rest of the plant. Plant stems, whether above or below ground, are characterized by the presence of nodes and internodes. Nodes are points of attachment for leaves, aerial roots, and flowers. The stem region between two nodes is called an internode. The stalk that extends from the stem to the base of the leaf is the petiole. An axillary bud is usually found in the axil (the area between the base of a leaf and the stem) where it can give rise to a branch or a flower. The apex (tip) of the shoot contains the apical meristem within the apical bud. Parts of a stem: Leaves are attached to the plant stem at areas called nodes. An internode is the stem region between two nodes. The petiole is the stalk connecting the leaf to the stem. The leaves just above the nodes arise from axillary buds. The stem’s anatomy consists of three tissue systems that work together to support, protect, and aid in nourishing the plant. The stem has three simple cell types: the parenchyma, collenchyma, and sclerenchyma cells that are responsible for metabolic functions, repairing and healing wounds, and storing starch. The stem is composed of three tissue systems that include the epidermis, vascular, and ground tissues, all of which are made from the simple cell types.. The xylem and phloem carry water and nutrients up and down the length of the stem and are arranged in distinct strands called vascular bundles. The epidermis is a single layer of cells that makes up the dermal tissue covering the stem and protecting the underlying tissue. Woody plants have an extra layer of protection on top of the epidermis made of cork cells known as bark. The vascular tissue of the stem consists of the complex tissues xylem and phloem which carry water and nutrients up and down the length of the stem and are arranged in distinct strands called vascular bundles. Ground tissue helps support the stem and is called pith when it is located towards the middle of the stem and called the cortex when it is between the vascular tissue and the epidermis. The stem and other plant organs are primarily made from three simple cell types: parenchyma, collenchyma, and sclerenchyma cells. Parenchyma cells are the most common plant cells. They are found in the stem, the root, the inside of the leaf, and the pulp of the fruit. Parenchyma cells are responsible for metabolic functions, such as photosynthesis. They also help repair and heal wounds. In addition, some parenchyma cells store starch. 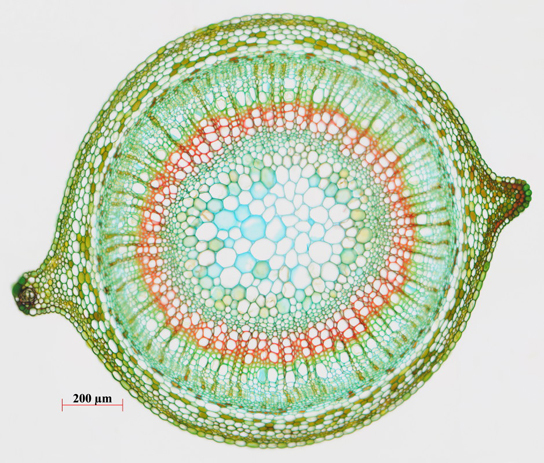 Parenchyma cells in plants: The stem of common St John’s Wort (Hypericum perforatum) is shown in cross section in this light micrograph. The central pith (greenish-blue, in the center) and peripheral cortex (narrow zone 3–5 cells thick, just inside the epidermis) are composed of parenchyma cells. Vascular tissue composed of xylem (red) and phloem tissue (green, between the xylem and cortex) surrounds the pith. Collenchyma cells are elongated cells with unevenly-thickened walls. They provide structural support, mainly to the stem and leaves. These cells are alive at maturity and are usually found below the epidermis. The “strings” of a celery stalk are an example of collenchyma cells. 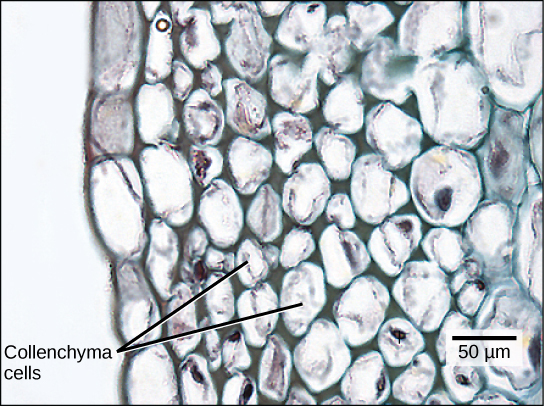 Collenchyma cells in plants: Collenchyma cell walls are uneven in thickness, as seen in this light micrograph. They provide support to plant structures. Sclerenchyma cells also provide support to the plant, but unlike collenchyma cells, many of them are dead at maturity. There are two types of sclerenchyma cells: fibers and sclereids. Both types have secondary cell walls that are thickened with deposits of lignin, an organic compound that is a key component of wood. Fibers are long, slender cells; sclereids are smaller-sized. Sclereids give pears their gritty texture. Humans use sclerenchyma fibers to make linen and rope. Sclerenchyma cells in plants: The central pith and outer cortex of the (a) flax stem are made up of parenchyma cells. Inside the cortex is a layer of sclerenchyma cells, which make up the fibers in flax rope and clothing. Humans have grown and harvested flax for thousands of years. In (b) this drawing, fourteenth-century women prepare linen. The (c) flax plant is grown and harvested for its fibers, which are used to weave linen, and for its seeds, which are the source of linseed oil. As with the rest of the plant, the stem has three tissue systems: dermal, vascular, and ground tissue. Each is distinguished by characteristic cell types that perform specific tasks necessary for the plant’s growth and survival. The dermal tissue of the stem consists primarily of epidermis: a single layer of cells covering and protecting the underlying tissue. Woody plants have a tough, waterproof outer layer of cork cells commonly known as bark, which further protects the plant from damage. Epidermal cells are the most-numerous and least-differentiated of the cells in the epidermis. The epidermis of a leaf also contains openings, known as stomata, through which the exchange of gases takes place. Two cells, known as guard cells, surround each leaf stoma, controlling its opening and closing and, thus, regulating the uptake of carbon dioxide and the release of oxygen and water vapor. Trichomes are hair-like structures on the epidermal surface. They help to reduce transpiration (the loss of water by aboveground plant parts), increase solar reflectance, and store compounds that defend the leaves against predation by herbivores. Stomata: Openings called stomata (singular: stoma) allow a plant to take up carbon dioxide and release oxygen and water vapor. The (a) colorized scanning-electron micrograph shows a closed stoma of a dicot. Each stoma is flanked by two guard cells that regulate its (b) opening and closing. The (c) guard cells sit within the layer of epidermal cells. The xylem and phloem that make up the vascular tissue of the stem are arranged in distinct strands called vascular bundles, which run up and down the length of the stem. Both are considered complex plant tissue because they are composed of more than one simple cell type that work in concert with each other. When the stem is viewed in cross section, the vascular bundles of dicot stems are arranged in a ring. In plants with stems that live for more than one year, the individual bundles grow together and produce the characteristic growth rings. In monocot stems, the vascular bundles are randomly scattered throughout the ground tissue. Vascular bundles: In (a) dicot stems, vascular bundles are arranged around the periphery of the ground tissue. The xylem tissue is located toward the interior of the vascular bundle; phloem is located toward the exterior. Sclerenchyma fibers cap the vascular bundles. 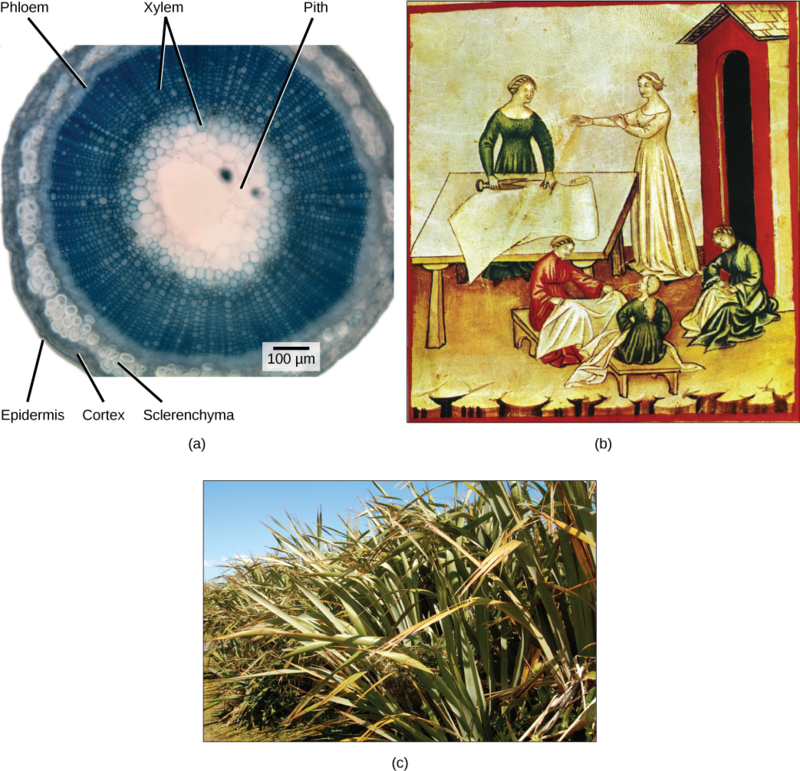 In (b) monocot stems, vascular bundles composed of xylem and phloem tissues are scattered throughout the ground tissue. Xylem tissue has three types of cells: xylem parenchyma, tracheids, and vessel elements. The latter two types conduct water and are dead at maturity. Tracheids are xylem cells with thick secondary cell walls that are lignified. Water moves from one tracheid to another through regions on the side walls known as pits where secondary walls are absent. Vessel elements are xylem cells with thinner walls; they are shorter than tracheids. Each vessel element is connected to the next by means of a perforation plate at the end walls of the element. Water moves through the perforation plates to travel up the plant. Phloem tissue is composed of sieve-tube cells, companion cells, phloem parenchyma, and phloem fibers. A series of sieve-tube cells (also called sieve-tube elements) are arranged end-to-end to create a long sieve tube, which transports organic substances such as sugars and amino acids. The sugars flow from one sieve-tube cell to the next through perforated sieve plates, which are found at the end junctions between two cells. Although still alive at maturity, the nucleus and other cell components of the sieve-tube cells have disintegrated. Companion cells are found alongside the sieve-tube cells, providing them with metabolic support. The companion cells contain more ribosomes and mitochondria than do the sieve-tube cells, which lack some cellular organelles. Ground tissue is mostly made up of parenchyma cells, but may also contain collenchyma and sclerenchyma cells that help support the stem. The ground tissue towards the interior of the vascular tissue in a stem or root is known as pith, while the layer of tissue between the vascular tissue and the epidermis is known as the cortex. Plants undergo primary growth to increase length and secondary growth to increase thickness. Indeterminate growth continues throughout a plant’s life, while determinate growth stops when a plant element (such as a leaf) reaches a particular size. Primary growth of stems is a result of rapidly-dividing cells in the apical meristems at the shoot tips. Apical dominance reduces the growth along the sides of branches and stems, giving the tree a conical shape. The growth of the lateral meristems, which includes the vascular cambium and the cork cambium (in woody plants), increases the thickness of the stem during secondary growth. Cork cells (bark) protect the plant against physical damage and water loss; they contain a waxy substance known as suberin that prevents water from penetrating the tissue. The secondary xylem develops dense wood during the fall and thin wood during the spring, which produces a characteristic ring for each year of growth. Growth in plants occurs as the stems and roots lengthen. Some plants, especially those that are woody, also increase in thickness during their life span. The increase in length of the shoot and the root is referred to as primary growth. It is the result of cell division in the shoot apical meristem. Secondary growth is characterized by an increase in thickness or girth of the plant. It is caused by cell division in the lateral meristem. Herbaceous plants mostly undergo primary growth, with little secondary growth or increase in thickness. Secondary growth, or “wood”, is noticeable in woody plants; it occurs in some dicots, but occurs very rarely in monocots. Primary and secondary growth: In woody plants, primary growth is followed by secondary growth, which allows the plant stem to increase in thickness or girth. Secondary vascular tissue is added as the plant grows, as well as a cork layer. The bark of a tree extends from the vascular cambium to the epidermis. Some plant parts, such as stems and roots, continue to grow throughout a plant’s life: a phenomenon called indeterminate growth. Other plant parts, such as leaves and flowers, exhibit determinate growth, which ceases when a plant part reaches a particular size. Most primary growth occurs at the apices, or tips, of stems and roots. Primary growth is a result of rapidly-dividing cells in the apical meristems at the shoot tip and root tip. Subsequent cell elongation also contributes to primary growth. The growth of shoots and roots during primary growth enables plants to continuously seek water (roots) or sunlight (shoots). The influence of the apical bud on overall plant growth is known as apical dominance, which diminishes the growth of axillary buds that form along the sides of branches and stems. Most coniferous trees exhibit strong apical dominance, thus producing the typical conical Christmas tree shape. If the apical bud is removed, then the axillary buds will start forming lateral branches. Gardeners make use of this fact when they prune plants by cutting off the tops of branches, thus encouraging the axillary buds to grow out, giving the plant a bushy shape. The increase in stem thickness that results from secondary growth is due to the activity of the lateral meristems, which are lacking in herbaceous plants. Lateral meristems include the vascular cambium and, in woody plants, the cork cambium. 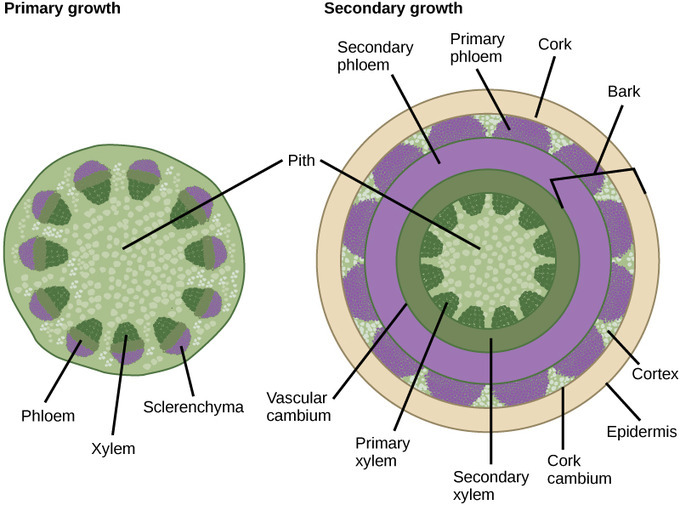 The vascular cambium is located just outside the primary xylem and to the interior of the primary phloem. The cells of the vascular cambium divide and form secondary xylem ( tracheids and vessel elements) to the inside and secondary phloem (sieve elements and companion cells) to the outside. The thickening of the stem that occurs in secondary growth is due to the formation of secondary phloem and secondary xylem by the vascular cambium, plus the action of cork cambium, which forms the tough outermost layer of the stem. The cells of the secondary xylem contain lignin, which provides hardiness and strength. In woody plants, cork cambium is the outermost lateral meristem. It produces cork cells (bark) containing a waxy substance known as suberin that can repel water. The bark protects the plant against physical damage and helps reduce water loss. The cork cambium also produces a layer of cells known as phelloderm, which grows inward from the cambium. The cork cambium, cork cells, and phelloderm are collectively termed the periderm. The periderm substitutes for the epidermis in mature plants. In some plants, the periderm has many openings, known as lenticels, which allow the interior cells to exchange gases with the outside atmosphere. This supplies oxygen to the living- and metabolically-active cells of the cortex, xylem, and phloem. 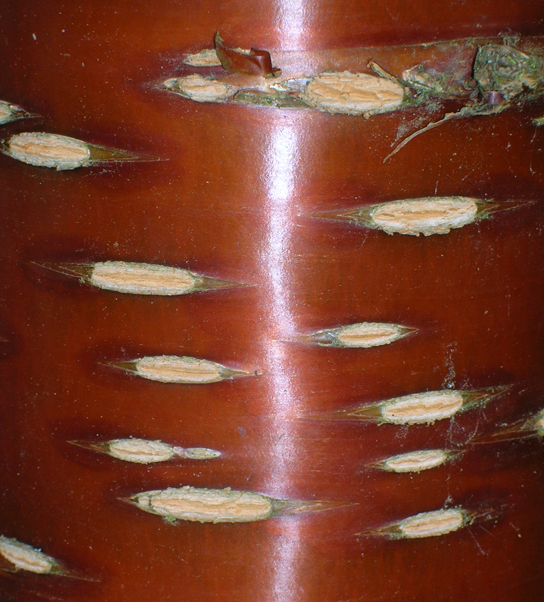 Example of lenticels: Lenticels on the bark of this cherry tree enable the woody stem to exchange gases with the surrounding atmosphere. The activity of the vascular cambium gives rise to annual growth rings. 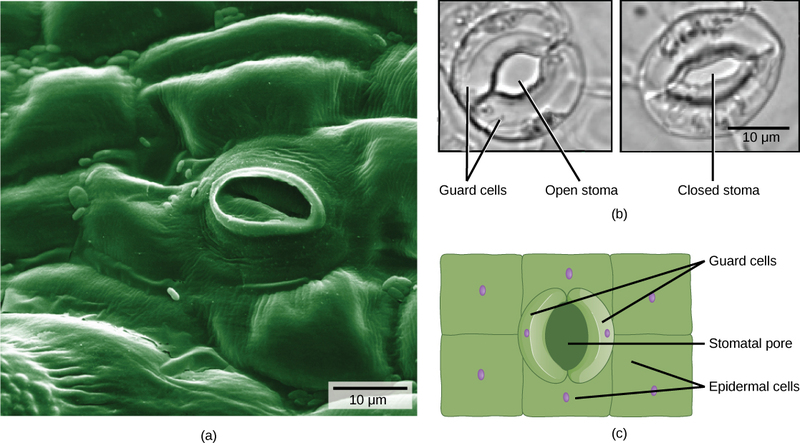 During the spring growing season, cells of the secondary xylem have a large internal diameter; their primary cell walls are not extensively thickened. This is known as early wood, or spring wood. During the fall season, the secondary xylem develops thickened cell walls, forming late wood, or autumn wood, which is denser than early wood. This alternation of early and late wood is due largely to a seasonal decrease in the number of vessel elements and a seasonal increase in the number of tracheids. It results in the formation of an annual ring, which can be seen as a circular ring in the cross section of the stem. 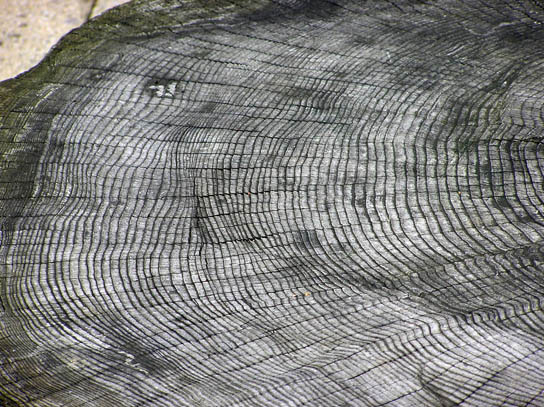 An examination of the number of annual rings and their nature (such as their size and cell wall thickness) can reveal the age of the tree and the prevailing climatic conditions during each season. Annual growth rings: The rate of wood growth increases in summer and decreases in winter, producing a characteristic ring for each year of growth. Seasonal changes in weather patterns can also affect the growth rate. Note how the rings vary in thickness. Stem modifications, either aboveground, underground, or aerial, enable plants to survive in particular habitats and environments. Modified stems that grow horizontally underground are either rhizomes, from which vertical shoots grow, or fleshier, food-storing corms. New plants can arise from the nodes of stolons and runners (an aboveground stolon): stems that run parallel to the ground, or just below the surface. Potatoes are examples of tubers: the swollen ends of stolons that may store starch. The stem modification that has enlarged fleshy leaves emerging from the stem or surrounding the base of the stem is called a bulb; it is also used to store food. 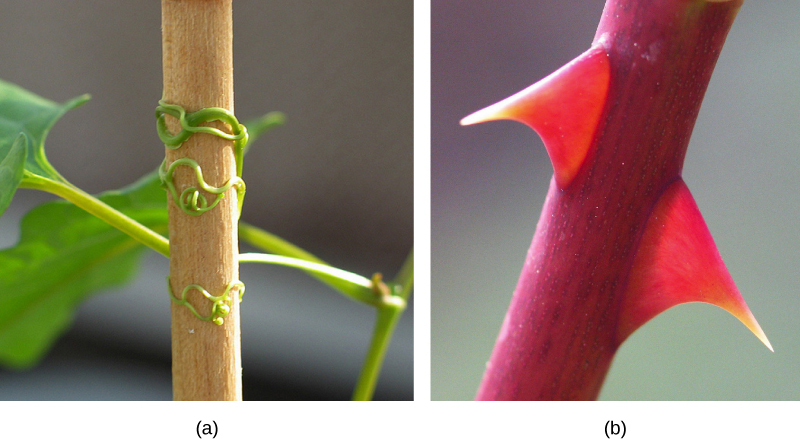 Aerial modifications of stems include tendrils, thorns, bulbils, and cladodes.. Some plant species have modified stems that are especially suited to a particular habitat and environment. A rhizome is a modified stem that grows horizontally underground; it has nodes and internodes. Vertical shoots may arise from the buds on the rhizome of some plants, such as ginger and ferns. Corms are similar to rhizomes, except they are more rounded and fleshy (such as in gladiolus). Corms contain stored food that enables some plants to survive the winter. Stolons are stems that run almost parallel to the ground, or just below the surface, and can give rise to new plants at the nodes. Runners are a type of stolon that runs above the ground and produces new clone plants at nodes at varying intervals: strawberries are an example. Tubers are modified stems that may store starch, as seen in the potato. Tubers arise as swollen ends of stolons, and contain many adventitious or unusual buds (familiar to us as the “eyes” on potatoes). A bulb, which functions as an underground storage unit, is a modification of a stem that has the appearance of enlarged fleshy leaves emerging from the stem or surrounding the base of the stem, as seen in the iris. Stem modifications: Stem modifications enable plants to thrive in a variety of environments. Shown are (a) ginger (Zingiber officinale) rhizomes, (b) a carrion flower (Amorphophallus titanum) corm (c) Rhodes grass (Chloris gayana) stolons, (d) strawberry (Fragaria ananassa) runners, (e) potato (Solanum tuberosum) tubers, and (f) red onion (Allium) bulbs. Aerial modifications of stems: Found in southeastern United States, (a) buckwheat vine (Brunnichia ovata) is a weedy plant that climbs with the aid of tendrils. This one is shown climbing up a wooden stake. (b) Thorns are modified branches. Tendrils are slender, twining strands that enable a plant (like the buckwheat vine) to seek support by climbing on other surfaces. These may develop from either the axillary bud or the terminal bud of the stem. Thorns are modified branches appearing as hard, woody, sharp outgrowths that protect the plant; common examples include roses, osage orange, and devil’s walking stick. Bulbils are axillary buds that have become fleshy and rounded due to storage of food. They become detached from the plant, fall on ground and develop into a new plant. Cladodes are green branches of limited growth (usually one internode long) which have taken up the functions of photosynthesis.